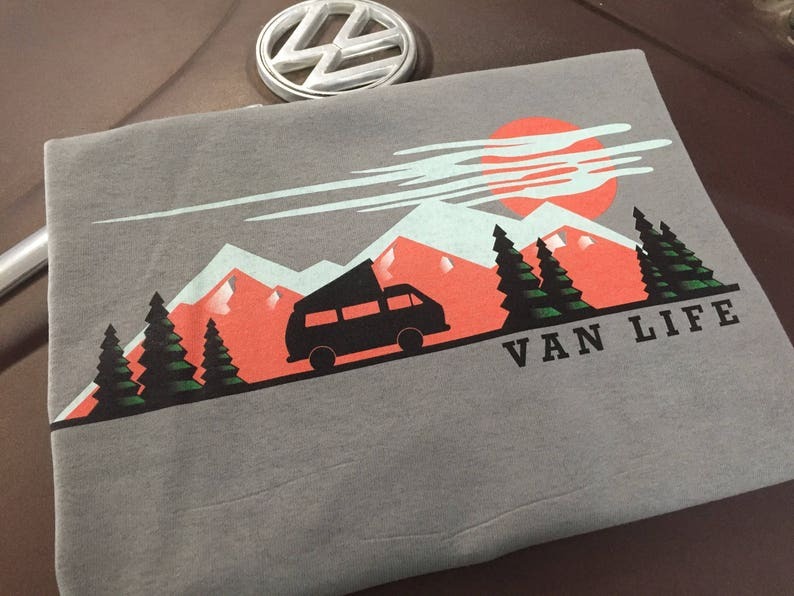 Van Life T-shirt in Color. Volkswagen Westfalia, Westy, Campervan, Camper Van, Camping, Camp More, Outdoors. Van Life T-shirt. 100% cotton, preshrunk T-shirt with colorful full front Van Life design on T-shirt colors gray & white. These are printed to order right here in the Volkswear Garage and typically ship same day. Sizes S-4XL. PLEASE SPECIFY SIZE AND COLR AT CHECKOUT. Van Life T-shirt. Vanlife, Buslife, Westy, Campervan, Camper Van, Camping, Camp More, Outdoors. Van Life Beach T-shirt. Volkswagen Westfalia, Westy, Campervan, Camper Van, Camping, Camp More, Outdoors. Van Life Dharma Shirt. Volkswagen Vanagon Westfalia, Westy, Campervan, Camper Van, Camping, Get Lost. Van Life Dharma Shirt. Volkswagen Baywindow Westfalia, Westy, Campervan, Camper Van, Camping, Get Lost. Volkswagen Vanagon 2WD Trucker Hat. Structured front with embroidered 2WD design. Mesh back with classic snap clasp. Van Life window decal bumper sticker. 3X5 inches. Van Life Trucker Hat. Structured front with embroidered Van Life design. Mesh back with classic snap clasp. Volkswagen Syncro Trucker Hat. Structured front with embroidered Syncro design. Mesh back with classic snap clasp. Love it! Seller was awesome and worked with me to make sure it arrived before Christmas, it means alot, thanks so much!! Volkswagen Syncro Trucker Hat. Structured front with embroidered locker design. Mesh back with classic snap clasp. Volkswagen Vanagon Syncro 4WD Trucker Hat. Structured front with embroidered 4WD design. Mesh back with classic snap clasp. Vintage Volkswagen Camper Van with Vintage Schwinn Orange Crate Post Cards 5 pack. Honk if I'm on Fire Bumper Sticker. Bug, Bus Window Decal. 2 for 5 free shipping. Vintage Volkswagen Campervan Post Cards 5 pack. Vintage Overland VW Deluxe Microbus.